A lot of car owners are faced with problems of buying car goods. In the online store "Gamby", every car enthusiast will be able to choose and buy the best quality and best car goods at any time convenient for him. 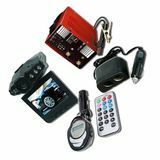 The site gamby.co.il presents a wide range of DVR and auto accessories, such as compressors, holders, vacuum cleaners, players, testers, chargers and much more at a pleasant price and with great discounts!